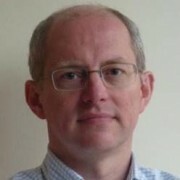 Xavier Dubois, Wolters Kluwer: who will be impacted by FRTB? Exactly who is affected as a result of the Fundamental Review of the Trading Book (FRTB)? Xavier Dubois, senior risk and finance specialist for EMEA at Wolters Kluwer, explores the subject. Earlier year, the Basel Committee on Banking Supervision (BCBS) set out the long awaited revised standards for minimum capital requirements for market risk. We now have the final iteration of FRTB. But who will be impacted? One thing if for sure – the new market risk standard will require banks to re-think risk architecture, inevitably increasing operational burden and related technology costs. This, of course, will lead to an increase in capital requirements. Essentially, all firms with a trading book will be impacted by this new regime – however as trading books are now defined differently – analysis is required from all firms. There is a fair amount of critique aimed at the old trading book/banking book boundaries – chief among them being that the previous definition led to insufficient capital being held against the risk that the banks were running, so it is no surprise this has been a key area for the BCBS. An additional point, and one which is sometimes forgotten, is that all firms dealing with commodity and instruments in a foreign currency, whether in the trading book or in the banking book, are impacted as well. The only firms not affected at all are those without trading book, without commodities and without any foreign currency positions – which of course are very few. The vast majority of firms are thus affected by this new regime. Fundamental to this new approach is the view that relevant information (focused on how positions are risk-managed as trading positions) will indicate the instruments that should be designated as trading positions. If for example, instruments managed on a trading desk or net short risk positions in equity, well, these must be in the trading book. So if specific, very explicit criteria are being met, then instruments need to be put into the trading book. The boundary definition is augmented with a presumptive list of instruments. In addition, the BCBS has issued guidance on instruments that should be assigned to the trading book. We’re talking here about instruments resulting from market making activities, from underwriting activities, any listed equity or equity investment in a fund; naked short positions; options and so on. There are also more stringent requirements governing internal risk transfers between the banking and trading books. We know that banks frequently hedge risk positions in the banking book so we have an internal derivative trade with the trading book, referred to as internal risk transfer, which is then followed by an offsetting derivative trade executed by the trading book with an external party. Of course, this happens a lot; it’s part of good risk management practice. However, in the past it was also very much used – or probably a better word to misused – as a mechanism to lower capital, AKA for capital arbitrage. The BCBS acknowledged the value of internal risk transfers that are allowed today, although they will only be allowed under more stringent requirements in order to avoid capital arbitraging opportunities. In particular, there will be no regulatory capital recognitions for internal risk transfers from the trading to the banking book. The Quantitative Impact Study (QIS) report and analysis is based upon voluntary and confidential information from approximately 78 banks in 26 jurisdictions from 31st December 2014. It is a comprehensive study comprising 66 group one banks and 12 group two banks. About 14 firms reported both trading book and banking book positions for the presented list of instruments. This shows the impact of the changes in trading book boundaries. 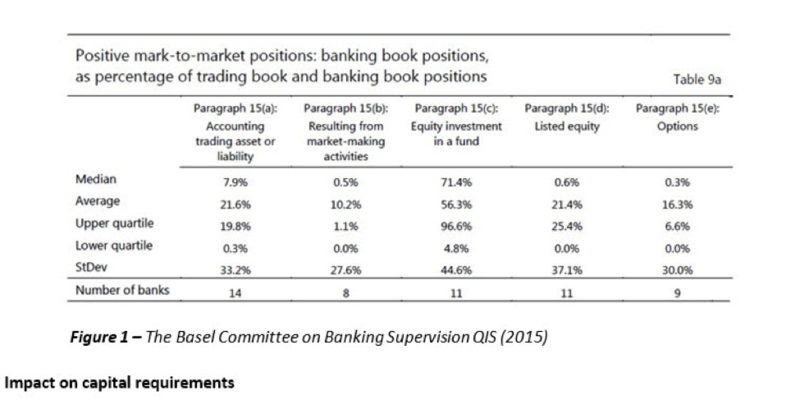 Details of positions in the banking book that, under the new regime, will need to be captured as trading book positions are shown in Figure 1 below. Instruments resulting from mark to market activities, listed equities and options are relatively small at 1% or less while average values are much larger. Market-making activities account for 10%, equity investments for around 56%, listed equity for 21%, and the proportion assigned to the banking book makes 20%. Similar results can be derived from positive and negative mark-to-market positions. This clearly shows the impact of the revised boundary definitions. We take a look at the new EU reporting requirements for managing exposure to shadow banking. There are plenty of challenges ahead, not least for the systems that will need to be updated to ensure that firms are able to adequately cope with the new guidelines. The BCBS research paper identifies ten key implications and related considerations for the industry. The Payments Market Practice Group has endorsed the use of Swift messages for intraday liquidity reporting. The Swift message set for intraday liquidity reporting underpins a rulebook created by the Liquidity Implementation Task Force, an industry group of twenty five large clearing banks, custodian banks and global brokers, to support compliance with Basel Committee on Banking Supervision requirements.